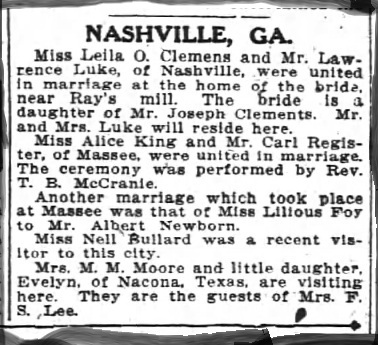 The January 12, 1913 edition of the Clinch County News announced the marriage of Leila Clements, of Ray City, and Lawrence Luke, of Nashville, GA.
NASHVILLE, GA. Miss Leila O. Clements and Mr. Lawrence Luke, of Nashville, were united in marriage at the home of the bride, near Ray’s mill. The bride is a daughter of Mr. Joseph Clements. Mr. and Mrs. Luke will reside here. Miss Alice King and Mr. Carl Register, of Masssee, were united in marriage. The ceremony was performed by Rev. T. B. McCranie. Another marriage which took place at Massee was that of Miss Lilious Foy to Mr. Albert Newborn. Miss Nell Bullard was a recent visitor to this city. Mrs. M. M. Moore and little daughter of Nacona, Texas, are visiting here. They are the guests of Mrs. F. S. Lee. 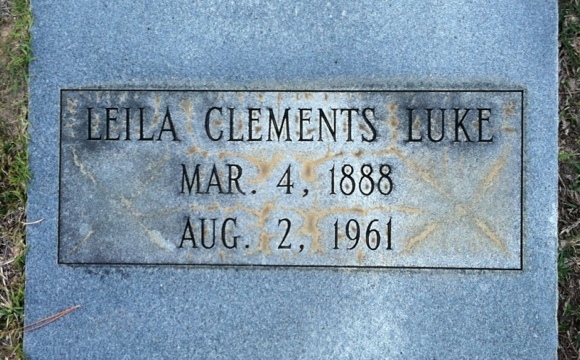 Leila Clements was a daughter of Martha Elizabeth Sirmans and Joseph Seaphus Clements, and a granddaughter of David G. and Jincy Clements. Leila’s father was a farmer, but she and the other Clements children all attended school. Wedding announcement of Leila O. Clements and Lawrence Luke appeared in the Atlanta Constitution, January 12, 1913. Lawrence Dupont Luke was a lawyer and former teacher from Nashville, GA. He was tall, dark and handsome, a slender man with grey eyes and black hair. He was a son of Oscar Bartow Luke and “Mattie” Martha Jane Walker, and a grandson of David Perry Luke. In 1917, Lawrence and Leila Luke were living in Douglas, GA, where Lawrence practiced law, while Leila kept house and tended their young children, Chester and James. Later, Leila and Lawrence made their home in Alma, GA. where they owned a house on Dixon Street. Their next door neighbor was hotel operator Elizabeth Dixon. 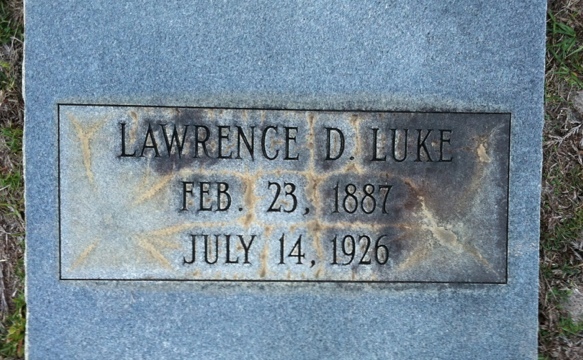 Lawrence D. Luke died in 1926 and was buried at the old city cemetery, Nashville, GA. Leila Clements Luke died in 1961 and was buried next to her husband. Upon their deaths Chester and James Luke were buried in adjacent graves.